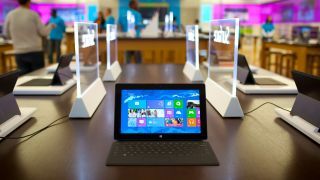 The Surface Mini has had its fair share of setbacks, with recent rumours claiming that Microsoft pulled the plug on its titular tablet back in May due to "fierce competition" in the small-size segment. Now, ever-reliable tech insider @evleaks has flicked the (pint-sized) life support machine switch back into the "on" position with a tweet that claims the Mini has rolled back onto the production line. It also reckons the device will see a summer release, though it doesn't say whether that's this year or 2015. We'd bet on the former considering that Microsoft's touch-friendly 'Gemini' version of Office is reportedly landing during the same period, and it would make sense for one to launch with the other. Touted to be a stylus-packing, OneNote-flaunting productivity marvel in the vein of the Surface Pro 3, the Surface Mini is rumoured to pack a Qualcomm or ARM processor and a 7-inch 1440 x 1080 pixel-resolution display with an iPad-like 4:3 aspect ratio. If the device makes it onto shelves, it will be interesting to see whether Microsoft risks further derision by sticking to its Windows RT guns, or if it outs a beefier full-fat Windows 8 version to take on offerings from its hardware partners - such as Lenovo's ThinkPad 8, Acer's Iconia W4 and Toshiba's Encore 2.